eHarmony was one of the first, and is arguably one of the most popular, matchmaking services created to enhance online dating. It was created by a psychologist who counseled married couples for decades, studying what made them happy together, and what didn’t. He used that knowledge to create a matchmaking service that relies on personality compatibility, which scientifically speaking, should result in stronger love connections among it’s users. The company continues to research, always fine-tuning their approach to matchmaking when new breakthroughs are found. eHarmony is now worldwide, and has members in the USA, Australia, Canada, the United Kingdom, and beyond. eHarmony boasts that, each day, 438 eHarmony members get married to people they were matched with by the service. The secret to this success is the comprehensive questionnaire each member must fill out when they begin the process. It features questions that target unique personality traits, aiming to pair those who will be compatible. The questionnaire can be filled out using most mobile devices, iPads, and computers. The questions are easy to understand, but some may find how personal they get invasive. After the questionnaire is completed, the user gets a Personality Profile, which highlights personality traits that are unique to that person, and then goes deeper into how those traits relate to their dating relationships. 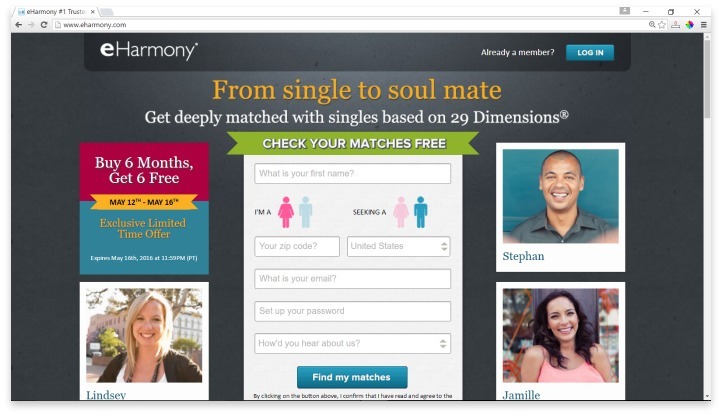 Then, eHarmony does its magic with algorithms that help pair up people who have qualities that go well together. After matches are calculated, they get sent to the user. Up to this point in the process, the service is free. If the suitors seem to have potential, the user can choose a membership and begin communicating with their matches. Many people shy away from online dating due to privacy issues. Some don’t want their picture on the Internet, and others may be worried about their information falling into the wrong hands. eHarmony only shares users’ photos and profiles with their matches, and everyone must be a member to be matched. eHarmony also offers various categories of dating for people who want to find partners who have similar values or background, so Christian, Asian, seniors, Hispanic, and black people can narrow the field to find exactly who they are looking for. There is also a local section that allows users to be matched in their area. Whenever using any online service to communicate with strangers it’s important to stay vigilant. No system is perfect, and some eHarmony members report being matched with shady characters who seem like scam artists. This is not isolated to eHarmony, and tends to be a side-effect of any Internet dating service. It’s important to note that eHarmony is a subscription service, so users are charged in installments which vary depending upon the member’s plan. To avoid unexpected charges, users can turn off the auto-renew feature on their account, but some users have reported being charged even though this safeguard was in place. eHarmony secret to their success is the comprehensive questionnaire each member must fill out when they begin the process. It features questions that target unique personality traits, aiming to pair those who will be compatible with. eHarmony is a well-known path for people who want to try Internet dating. They have a strong history in the field, and plenty of success stories to prove it. The service is pricey, and it takes some time to fill out the lengthy questionnaire, and patience to dig through potential matches before finding “the one.” Like all interactions online, users need to be careful and verify all the information conveyed by their potential matches to avoid scams. Also, to avoid billing issues which consumers have reported, users who want to try the service should use prepaid cards that cannot be overcharged, thereby preventing some of the reported unauthorized charges. Have you had an experience with this company? Please share your eHarmony reviews below. Meh. Didn’t work for me. Lot’s of questions which is understandable but no happy ending for me so not really worth it.